The Dell Latitude E7270 Ultrabook Laptop intersects style and structure with premium materials, including a spill proof keyboard, LCD back, and a magnesium alloy chassis to give you best of form and functions. This 1260g lightweight laptop is powered by a 2.6GHz Intel Core i7 6600U Dual Core processor that is capable of running almost every application to its utmost potential thanks to its Hyper Threading Technology. The 8GB RAM module of the E7270 Dell Ultrabook gives you glitch free multimedia experience. 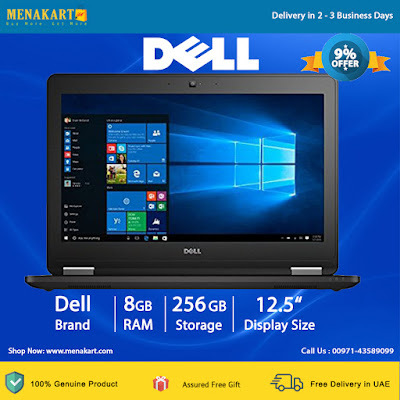 Built in Intel HD Graphics adapter of the this Dell Latitude 12inch laptop tackles all the visual processing and gives flawless HD media playing experience. The Dell Latitude Ultrabook, sporting a black finish, incorporates a 256GB SSD that offers up to 100 times faster data read and write speeds than a conventional magnetic hard drive. And the result? You get faster boot up and app execution with reduced latency. The Dell Latitude E7270 Ultrabook Laptop reviews all talk about its 12inch display that renders FHD resolution and produces awe inspiring visuals on screen.